The Olympos Sports Centre has facilities for a wide range of indoor and outdoor sports. For sports medicine, please look under medical facilities. Utrecht University has teamed up with Olympos to create a number of sports facilities at the Utrecht Science Park. There are a challenging boot camp location, two volleyball fields, two football fields and a trail for a 5km endurance run. Sprint distances of 200 and 400 meters are to be added. See overview map. On the roof of grand café The Basket (on the corner of Heidelberglaan and Genèvelaan) is a basketball court, which is freely accessible for everyone. For organised competitions, permission is required in advance from Corporate Real Estate & Campus, vcsecr@uu.nl. The Utrecht University Botanical Gardens are located in the centre of the Park on Hoofddijk. The gardens are open to the public between 1 March and 1 December and activities are organised on a regular basis. 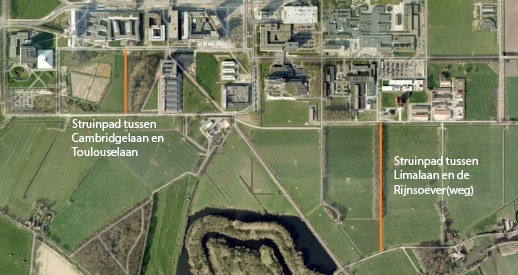 From Limalaan, near the combined heat and power plant, a new walking trail has been created through the meadows towards Rijnsoeverweg. Staff, students and visitors can now easily walk through De Uithof to the area of natural beauty around Fort Rhijnauwen. You can also walk round in a loop via Zandlaan. Bridges have been constructed at the beginning and end of the trail. Unfortunately, the trail is not accessible for wheelchair users. Another footpath has been laid down between Cambridgelaan and Toulouselaan. From Hoofddijk, an agricultural lane has been created leading through the northern meadows to Münsterlaan. This paved road can be used by both walkers and cyclists, so it offers even more leisure opportunities. The Park on Hoofddijk in Harvardlaan is home to De Uithovenier (in Dutch) vegetable garden association, which oversees a total of 66 plots. The association is open to students and staff at UMC Utrecht, Utrecht University and Hogeschool Utrecht, but at present there is a waiting list. On Toulouselaan, behind the childcare facilities, there is a playground with beautiful views over the Rhijnauwen and Amelisweerd country estates. The site is accessible for everyone, equipped with benches and paths and the lawns are tended by the university. Due east of De Uithof is the Oostbroek Estate (in Dutch), a site of special ecological interest owned by Utrechts Landschap, which includes the shop ‘t Winkeltje van het Landschap. The Rhijnauwen Estate, which includes the Rijnauwen Waterline Fort and the Hoge Bos forest, is the part of the estates of Nieuw-Amelisweerd, Oud-Amelisweerd and Rhijnauwen in the Kromme Rijn area, and the closest to De Uithof. These estates (in Dutch) make up Utrecht’s foremost recreational facility.